Wurst Soup is a family tradition that is made around the holidays especially on cold days on my fiancée’s side. 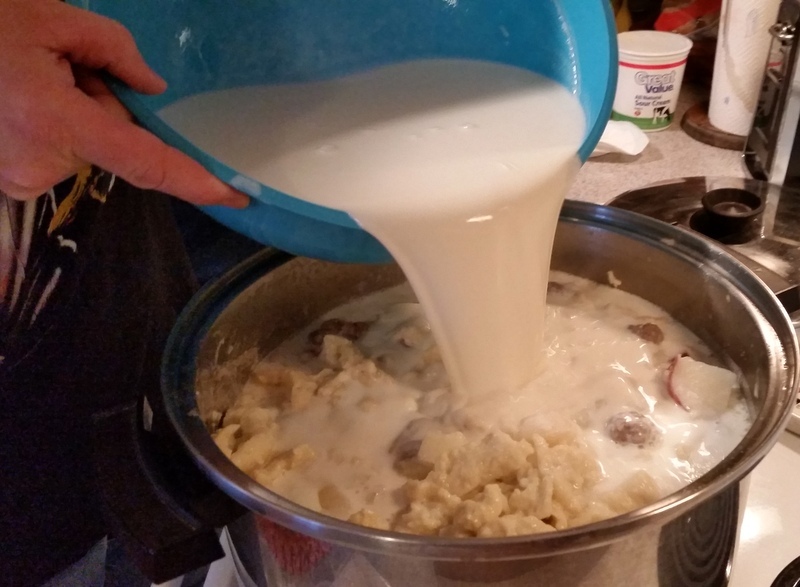 It is a German soup made with sausage, potatoes and dumplings along with a sour cream mixture to make it creamy. When I first learned about this soup I thought the name of it was kind of weird. 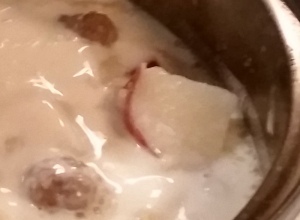 Is it the worst soup ever or is it good? Turns out it’s really good and Wurst is a German word meaning sausage. I looked up two of the other ingredients to see what the German words were. 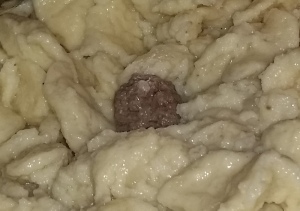 They are: Dumpling is Knödel. Potato is Kartoffel. Being that I don’t speak German even though I am German the words are a little tricky to say. In this soup my fiancée’s family actually didn’t make it with sausage. Instead they substituted it out for hamburger which works just fine in the soup with all the rest of the other ingredients. Actually when my fiancée and I made it we used venison burger. I like that you can use a different meat if you wish to with this soup. 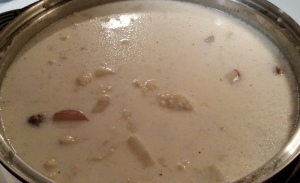 Also with the sour cream mixture you can do it the other way around with taking the soup water out first then adding the sour cream a little at time while stirring it. That’s how my fiancée does it. The making of the soup isn’t really too hard but it is a bit tedious and you need to cook it in steps as the recipe says. I had a lot of fun learning how to make this. Once it is done you can sit back and enjoy the taste of it. It goes well with salad and rolls. In a 12 quart kettle Cuisinart 766-26 Chef’s Classic 12-Quart Stockpot with Cover add a little more than 1/3 full of water. Add 2-3 Tbsp. salt and 1 Tbsp. garlic salt. Add 1 finely chopped large onion. Bring to boil, then turn down to a medium temp and let simmer. Then add meatballs (see below). Turn up heat and let meatballs cook a little before turning down to simmer. Add potatoes. Lastly will be making and adding dumplings. Peel, rinse and cut into bite size pieces. Be careful not to cut them too little or they will turn to mush. When you using red potatoes, leaving the skin on is ok since they are tender enough to do so. When using the other kinds of potatoes, you will want to peel them. Make dumplings right away after you put in potatoes. In a large bowl, add 12 eggs and a ½ cup of water. Use a whisk to mix it up with. Add one tsp. of salt and one tsp. pepper. Mix well. 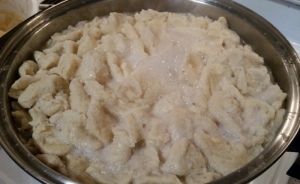 Slowly add flour then use whisk to mix it with. Keep adding flour until thick. 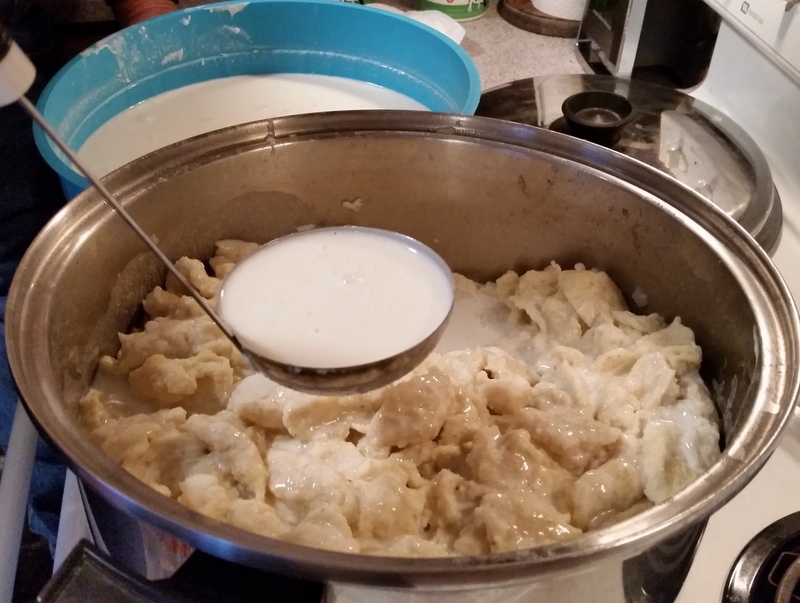 Use a half teaspoon of dough to dunk the dumplings into water. Do not make them too big. They will slide off into the water. Cover and let them expand. Do not boil on high. Add more salt and pepper to taste. Let simmer for about a half hour. Take a little taste of the dumplings and potatoes to make sure done. Them remove from stove to cool a bit then serve. Enjoy! Let it boil until potatoes were cooked and then simmer for about 20 min or so to let the flavors come to life. I will def be making this again and again and to pot lucks and get together s. Thanks so much for the recipe.